This week’s political battles over immigration, funding for the Department of Homeland Security and the Keystone XL pipeline have been waged by opposing parties that possess starkly different strengths and weaknesses. Majorities say the Democratic Party is open and tolerant, cares about the middle class and is not “too extreme.” By contrast, most Americans see the GOP lacking in tolerance and empathy for the middle class, and half view it as too extreme. Nonetheless, the Republicans more than hold their own with the Democrats in views of which party can better handle major issues. The Republican Party runs even on the economy and immigration and holds double-digit leads over the Democrats on terrorism, foreign policy and taxes. President Obama’s job approval has ticked up in recent months, to 48% currently, and his rating dwarfs the 26% approval measure for the leaders of the new Republican Congress. 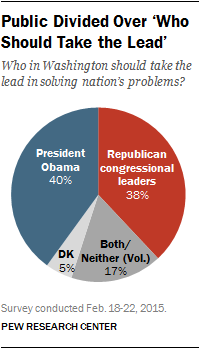 Yet the public is divided over whether Obama or Republican congressional leaders should take the lead in solving the nation’s problems: 40% say Obama while 38% say GOP leaders. That is virtually unchanged from a few days after the midterm elections in November. The latest national survey by the Pew Research Center, conducted Feb. 18-22, 2015 among 1,504 adults, finds that both parties are viewed by majorities as having strong principles. Somewhat more say this about the GOP (63%) than the Democratic Party (57%). About six-in-ten say the Democratic Party “cares about the middle class” (60%) and “is tolerant and open to all groups of people” (59%). By comparison, 43% say the GOP cares about the middle class, and 35% say it is tolerant and open to all. 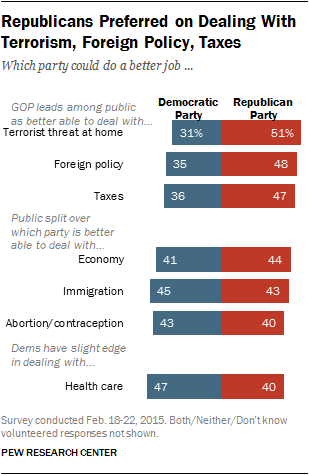 And while about as many say the Republican Party is too extreme (50%) as say it is not (46%), just 36% view the Democratic Party as too extreme; 59% say it is not. For the most part, opinions about the two parties’ traits are little changed from recent years. The gap is much narrower when it comes to opinions about whether each party “has good policy ideas.” About half (52%) say the Democratic Party has good policy ideas while nearly as many (48%) say the same about the GOP. And the Republican Party fares much better on issues than image. Despite the majority view that the GOP lacks empathy for the middle class, about as many Americans say the Republican Party (44%) as the Democratic Party (41%) can do better in dealing with the economy. On immigration the public also is divided: 45% say the Democrats can do better, while 43% prefer the GOP. The only issue on which Democrats have an edge is on health care (47% to 40%). Republicans have opened substantial leads on dealing with the terrorist threat at home (20 points), making wise decisions about foreign policy (13 points) and dealing with taxes (11 points). On each of these issues, the GOP’s lead is as wide—or wider—than at any point in the last several years. Views of the party best able to handle foreign policy have taken a particular turn in favor of the Republican Party: Today 48% say the GOP would do a better job on this issue, while 35% say the Democratic Party. This is the first time during the Obama administration that the GOP has held the edge on foreign policy. The survey finds that opinions of the 2010 health care law – which will soon face a major challenge in the Supreme Court – remain little changed: Public opinion continues to be closely divided, with views somewhat more negative than positive (53% disapprove, 45% approve). Americans remain split over the law’s future: 50% say the law’s major provisions are “probably here to stay” while 45% think they “will probably be eliminated.” The divided views of the law’s fate also are largely unchanged over the past year. In April 2014, 49% said the law was probably here to stay while 43% said it would probably be eliminated. 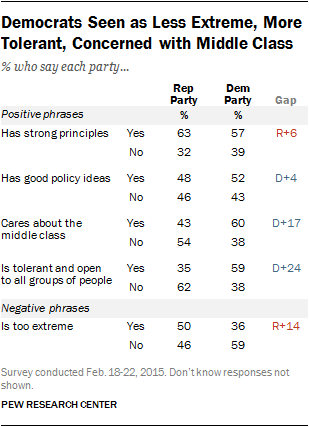 Overall, large majorities of partisans say their own party has strong principles, good policy ideas, cares about the middle class and is tolerant and open to all groups of people—and few say it is “too extreme.” At the same time, positive views of the other party are relatively uncommon, but there are some notable exceptions. For instance, on most positive characteristics, fewer than a quarter of Democrats offer positive evaluations of the GOP, but half (50%) of Democrats say the GOP has strong principles. By comparison, 35% of Republicans say the same of the Democratic Party. And about a third of Republicans (33%) say that the Democratic Party is tolerant and open to all groups, while 36% say it cares about the middle class. Far fewer Democrats attribute either of these characteristics to the GOP; just 8% say the Republican Party is tolerant and 19% say it cares about the middle class. Although majorities of both Democrats and Republicans say the other party is too extreme, fully 77% of Democrats say this about the GOP, while fewer Republicans (65%) say this about the Democratic Party. The Democratic Party also fares better than Republicans on this measure among independents: 54% say the GOP is too extreme, compared with 38% who describe the Democratic Party this way. More independents also say the Democratic Party is tolerant and open (58% Democratic Party, 33% Republican Party), and concerned about the middle class (56% Democratic Party, 40% Republican Party). Majorities of independents say each party has strong principles, though somewhat more say this applies to the GOP (63%) than to Democratic Party (54%). When it comes to views of whether the two parties are concerned about the middle class, the Democratic Party is viewed similarly across all income categories. But there are bigger differences by income in opinions about whether the Republican Party cares about the middle class. By 54% to 44%, more people with family incomes of at least $100,000 say the Republican Party cares about the middle class. 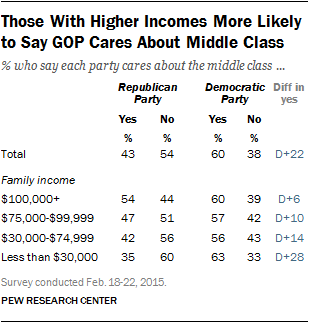 But people in lower income groups have mixed views or say that description does not apply to the GOP. The Republican Party has an advantage on several key issues, including terrorism and foreign policy, while Americans are divided about which party would do the best job on other key issues — the economy and immigration. Democrats maintain a slim edge as the party better able to handle health care. The Republican Party continues to hold a sizeable (20-point) lead as the party that could do a better job “dealing with the terrorist threat at home.” But today, the Republican Party also has a 13-point edge when it comes to “making wise decisions about foreign policy.” This is the first time the GOP has had a significant advantage on this issue since 2002. As recently as October, neither party had an edge on this measure. Partisans’ views on this issue are little changed since the fall; fully 81% of Republicans say the GOP is best equipped to handle foreign policy, while a smaller majority of Democrats (66%) say their party could do the better job. But the opinions of independents have shifted in the direction of the GOP: Currently, the Republican Party has a 24-point advantage on foreign policy among independents (52% vs. 28%); in October independents were about evenly divided (36% Republican Party, 34% Democratic Party). The GOP is also now seen by more as the party better able to handle taxes (47% vs. 36%); in January 2014, neither party had an advantage on this issue (41% each). Though the views of Republicans and Democrats on this question are little changed over the last year, the GOP now enjoys a 27-point edge among independents (53% vs 26%); independents were more closely divided last year (43% said Republicans, 36% said Democrats). The Democratic Party still holds a slight edge as the party that could do the better job on health care (40% say Republicans, 47% Democrats). The two parties continue to run about even in views of which party is better able to handle the overall economy (44% say the Republican Party, 41% the Democratic Party) and immigration (43% Republicans, 45% Democrats). The public is also divided over which party could do a better job regarding policies on abortion and contraception (40% say Republicans, 43% Democrats). 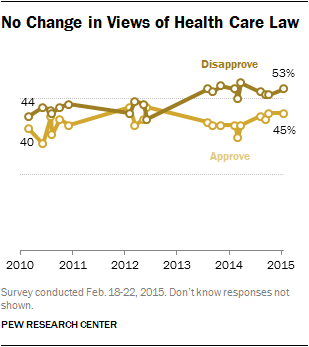 The Affordable Care Act (ACA) remains highly polarizing. Although views of the 2010 health care law have not changed over the last several years, it continues to split the public overall, and Republicans and Democrats are largely on opposite sides of the issue. Fully 87% of Republicans oppose the health care law while just 11% approve of it. And opposition to the law is most pronounced among conservative Republicans (92% disapprove). Conversely, 78% of Democrats approve of the ACA (including 89% of liberal Democrats), and just 19% disapprove of it. The balance of opinion among independents remains more negative than positive: 58% disapprove, while 39% approve. 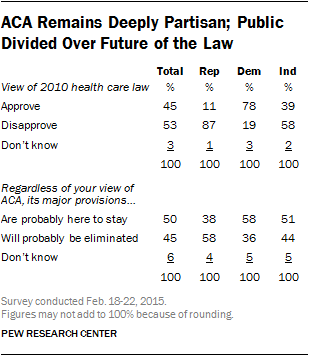 As was the case last spring, the public is about evenly split in views about the future of the law: 50% say that the major provisions of the ACA are “probably here to stay,” and 45% think the major provisions “will probably be eliminated.” And while most Democrats say the provisions are here to stay (58% vs. 36% who say they will be eliminated), the balance of opinion among Republicans is reversed: 58% say the provisions will likely be eliminated, while 38% say they are here to stay. Barack Obama’s job approval is little changed over the last month, with Americans about equally likely to say they approve of his job performance (48%) as disapprove (46%). But his current ratings reflect a shift in a positive direction from last year. Obama’s rating among independents, in particular, has ticked higher in recent months; 45% of independents now approve of his job performance, similar to his rating last month (42%), but significantly higher than in December (39%) and throughout much of 2014. 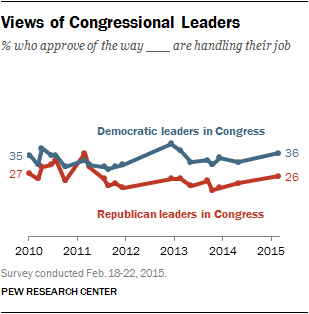 Ratings of the job performance of congressional leadership remain far less positive than those of the president, and—as in recent years—more Americans approve of the job being done by Democratic congressional leadership than Republican leaders. Currently 36% approve of the job performance of Democratic leaders, while just 26% approve of Republican leaders. Both ratings are slightly higher than they were last spring. Independents give the Democratic leadership higher marks (31% approve) than the Republican leadership (21% approve), but the comparatively lower ratings for the GOP’s leaders also reflect the relatively low marks Republicans give their own leadership. Currently, just 50% of Republicans say they approve of the job performance of GOP leaders in Congress; by contrast, 64% of Democrats approve of their party’s congressional leadership.